The Discovery 55 MkII is a quality large blue-water cruiser that’s designed to be easily handled by a couple, says Rupert Holmes. The Discovery 55 Mkll is a result of evolution, rather than revolutionary changes. 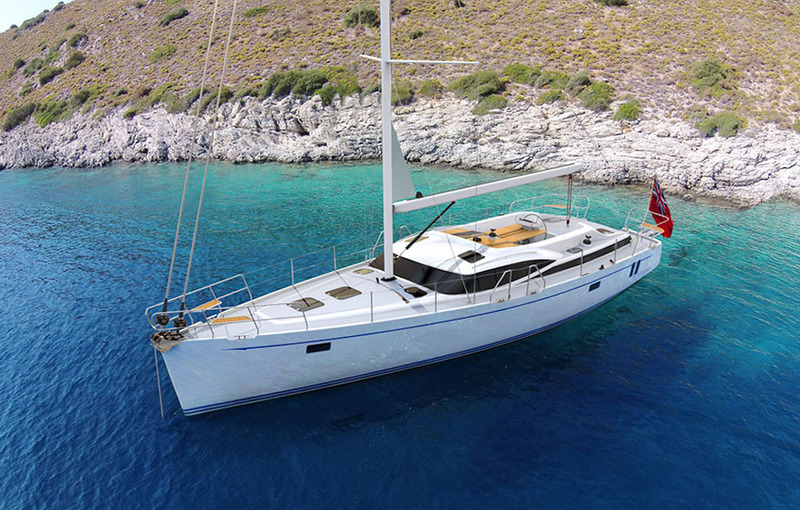 The original boat, designed at the end of the 1990s, was the product of two years of research with the aim of producing a superlative blue water cruising yacht that could easily be handled by a couple. 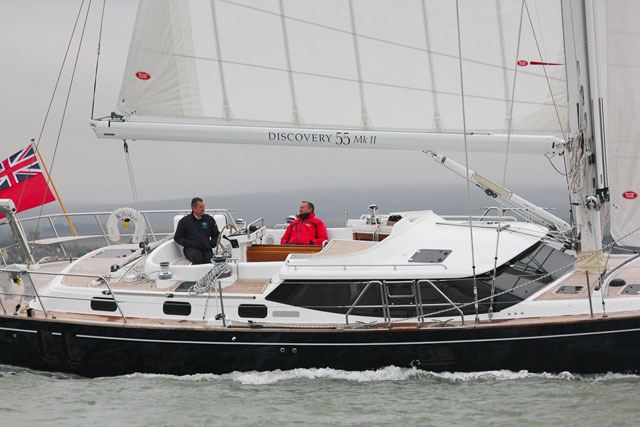 For a more in-depth look at the builder, see: Discovery Yachts: A British Boat Builder on the up. Discovery 55 MkII – built for blue-water adventuring in comfort. Many small changes have been incorporated in the 55 over the years, although the step change that led to the MkII came with the production of a new one-piece deck moulding that gives more contemporary and sleek styling to the deck saloon’s coachroof, along with the adoption of flush deck hatches. This includes narrower mullions, but retains the opening forward windows that provide excellent natural ventilation when at anchor. Another trademark Discovery feature retained in the new model is the watch keeper’s station, just inside the companionway. This gives a clear 270 degree view around each side of the boat and ahead – even when heeled it’s possible to see the horizon on the lee side. In addition, there are a further 60-70 improvements, many of them resulting from feedback gained from existing owners, who have collectively sailed hundreds of thousands of miles. Owners are offered a wide range of choice in terms of interior specifications, although the layouts tend to remain the same, with a large owner’s suite aft, generous galley, sizeable deck saloon that incorporates the navigation/watch keeper’s station. Forward of the mast there’s a double guest cabin, plus a twin berth pullman cabin and a further heads compartment, or the option of a second large guest suite. Discovery 55 MkII interior plan. Other detail changes on the new boat include two vertical hull windows in the owner’s cabin, a change made possible by advances in technology. Discovery has also improved its already excellent level of custom interior joinery thanks to a new five-axis CNC router that offers more scope to incorporate clients’ specific wishes. The owner of the first MkII boat opted for a more open saloon layout than Discovery’s usual layout that’s optimised for long-term use at sea, rather than maximising the feeling of space when in port. However none of the trademark Discovery features, including the raised deck saloon seating, and easy three-step companionway have been compromised. 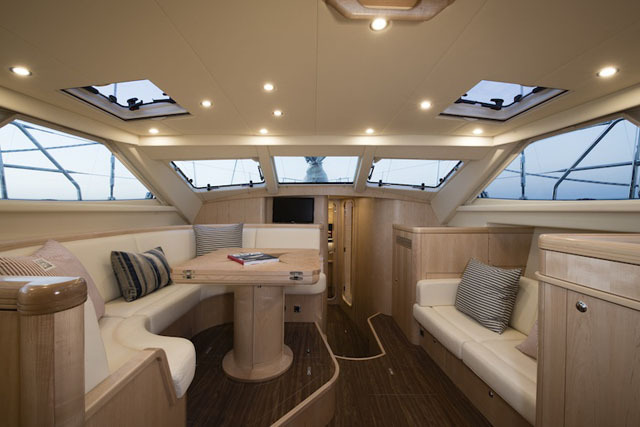 Deck Saloon – Discovery 55 MkII: the opening forward-facing windows are great for ventilation at anchor. Our test boat was fitted with a light maple interior, although cherry and oak are also offered as standard alternatives, while a wider range of timber is offered as options. Owners are encouraged to talk directly to the teams that will be building their boats and discuss possibilities with the joiners that will be making the furniture. The narrow linear galley, which has proper deep fiddles to the extensive worktops, is ideal for use at sea, while the bin, fridge and freezer are all located at the forward end to minimise the ‘excuse me’ factor when crew want to get drinks or snacks. The GN Espace cooker was specifically designed for Discovery as the ultimate marine cooker and there’s a 300 litre custom made fridge that maximises space by fitting the outer profile of the hull. The new boat retains the original Ron Holland designed hull that was conceived to provide a comfortable motion at sea, along with easy handling and a good turn of speed. It’s fine in the ends, with the weight of major systems concentrated as much as possible in the middle of the boat, and benefits from a low centre of gravity bulb keel with, in today’s terms, a reassuringly high ballast ratio of 42 per cent. The upshot of this is a boat that doesn’t pitch up and down unduly in a head sea and has excellent stability. The original Ron Holland designed hull remains unchanged on the MkII version designed to provide a comfortable motion at sea, along with easy handling and a good turn of speed. 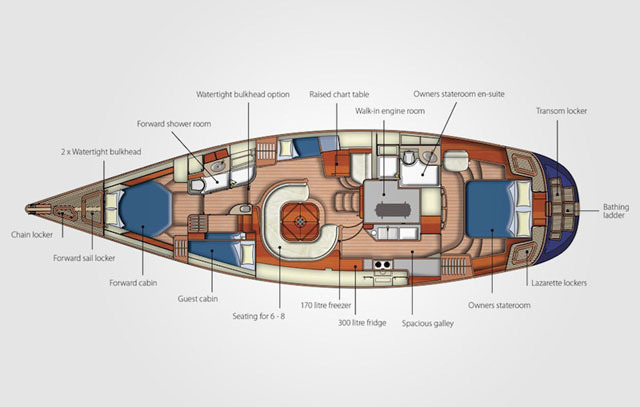 Despite Discovery’s willingness to incorporate owners’ wishes into their new boat, very few clients specify changes to the deck layout. 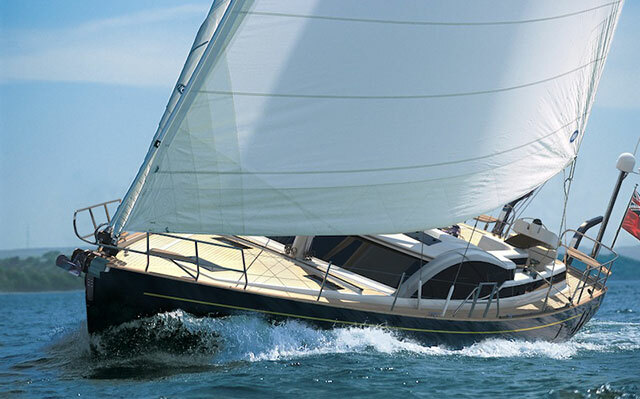 The biggest differences between individual boats are in whether or not the optional electric furling is specified, whether there’s a spinnaker/gennaker, and in the choice of cloth for the genoa, self-tacking jib and mainsails. The consistency in the deck layout is testament to the thought, planning and depth of knowledge that went into the original arrangement. 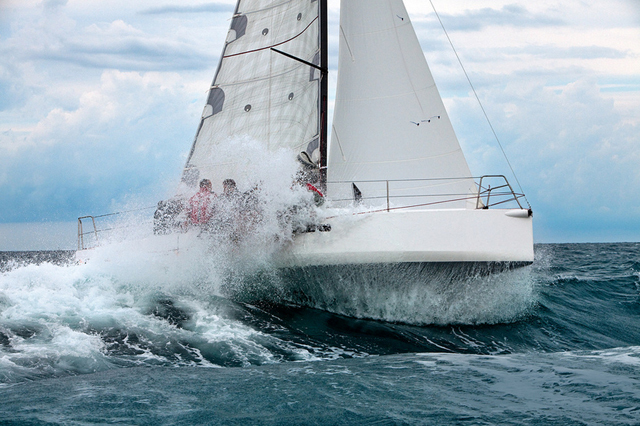 Single or shorthanded sailing is anticipated with the numerous electrically powered sail control options available. While I would have liked to have seen a higher specification of cloth than the Dacron the owner of our test boat had specified, I couldn’t fault the set up in any other way. 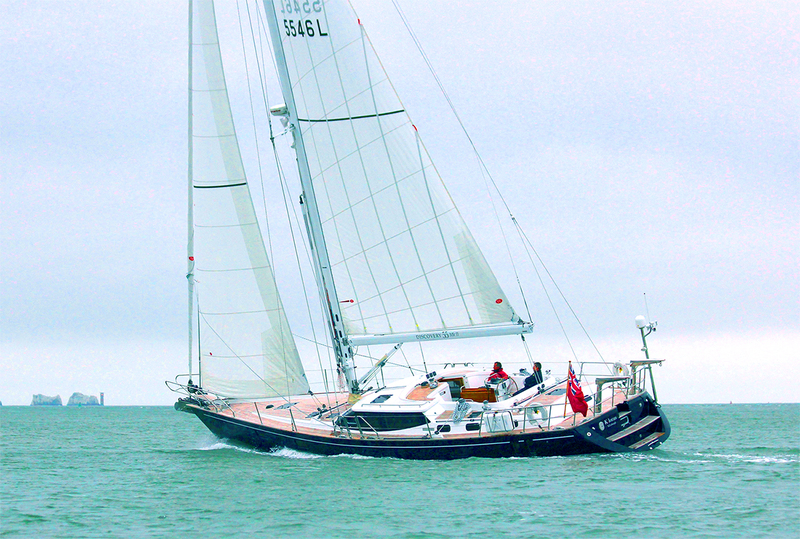 With the optional electric furling fitted it was push-button sailing at its best. With the pilot steering the boat, no operation, whether setting sail, reefing or tacking needed more than one person on deck. 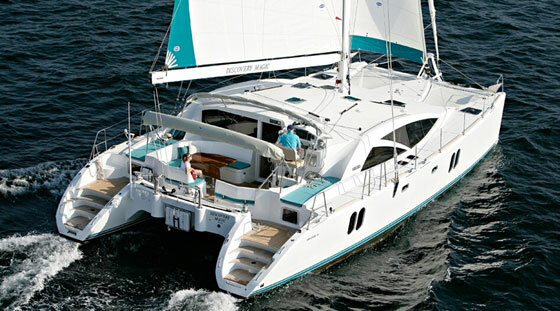 The twin headsail rig with a self-tacking blade jib and a large overlapping genoa is a very adaptable set up. 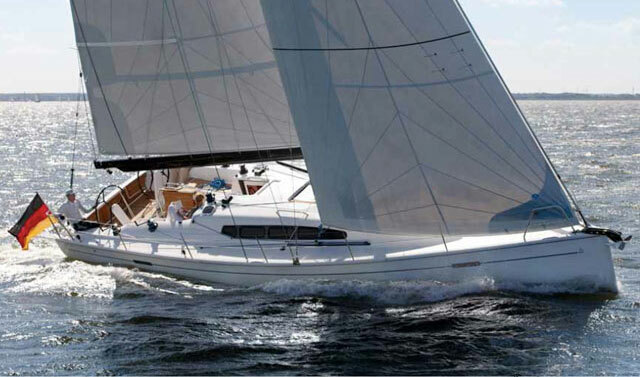 It allows for easy running downwind under twin poled out headsails in tradewind conditions, while also offering efficient options for a variety of reaching and closehauled wind angles. This leaves the biggest option being whether to include asymmetric and/or symmetric spinnakers for light airs running and reaching wind angles, with around 50 per cent of owners opting for such a sail. Our test boat was fitted with a small (90cm) diameter wheel, although larger folding options are also offered. The smaller one proved entirely adequate, allowing a good view of the luff of the self tacking jib, while maximising cockpit space, making it a good choice for a long distance boat that will be predominately steered by the pilot. The size and displacement of the Discovery 55 means that by its very nature this is a powerful boat. 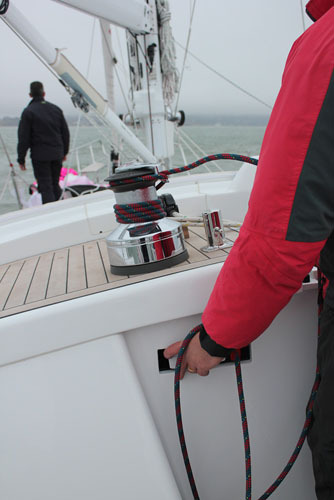 That power is impressively tamed by the sail handling systems, although you’d need to be sure that anyone involved with sail handling is well versed in good winch discipline as the loads in the lines could easily be underestimated by the unwary. Fast, easy sailing under autopilot with impressive all-round visibility. Discovery owners tend to like to get very involved in terms of interior finishes and the detail of the joinery, however, there are many fewer items on the options list than for many boats, which is a reflection of the high level of standard equipment. 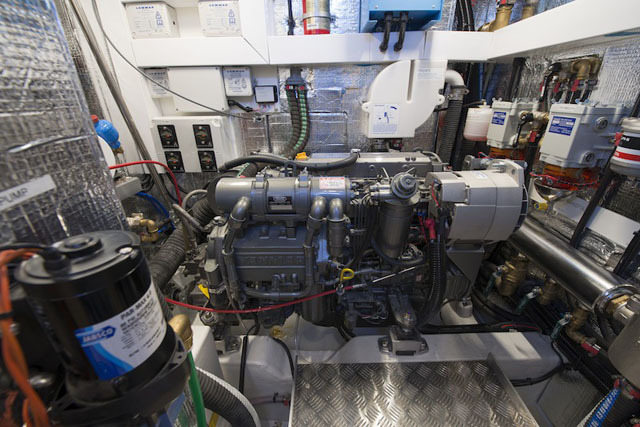 For instance, diesel generators, heating and air conditioning, electric winches and high specification washer/driers are all fitted as standard. One area in which owners do have an option is in the choice of sail cloth. 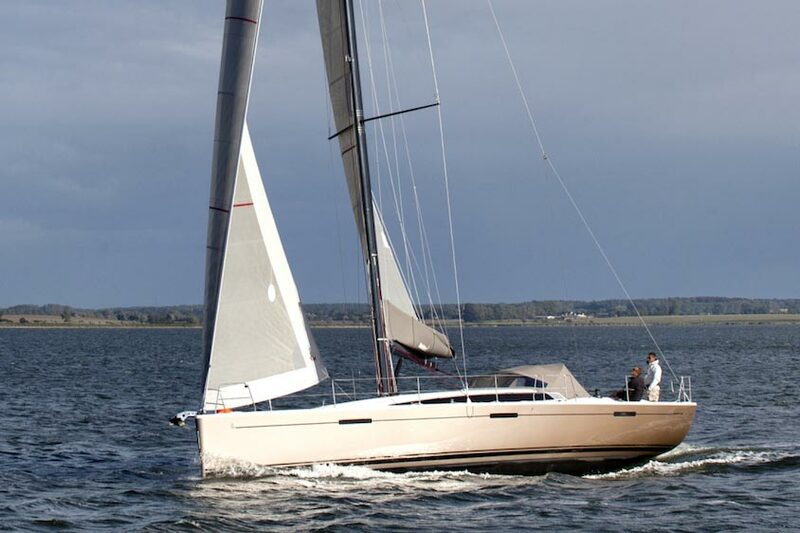 As an example, One of the next Discovery 55 Mklls to leave the factory has been specified with top of the range North 3Di sails. Attention to detail, a simple and uncluttered, yet efficient deck layout and a superb interior are all key Discovery attributes. But the company’s ethos of producing boats optimised for long distance sailing crewed only by the owners continues long after each boat leaves the factory. Boats of this style are, by necessity, complex entities and when cruising long distances in remote areas there’s potential for maintaining the systems and dealing with breakdowns to be a challenge. However, Discovery puts a lot of effort into after-sales support as an integral part of the product it offers. A generator, air-conditioning and even a washing machine and drier are included as standard on the Discovery 55 MkII. For example, the company keeps the full specification of every boat it has built on file and maintains 24-hour technical support for owners of all ages of Discovery Yachts. “Often we can solve problems there and then,” says director Alistair Walton, “but if we can’t, we can have an engineer waiting for the boat when it arrives at its next port, even if that’s in a far-flung part of the world.” Discovery also has an on-site presence to support owners in big events such as the ARC and World ARC. There are two compromises, however, that spring immediately to mind – firstly, any yacht offering this amount of space, comfort, power and ease of handling is a complex one. That has a knock-on effect in the amount of maintenance needed and, while Discovery Yachts’ philosophy helps to optimise this, it still means more work and expense than a boat that is less complex. Secondly, building a boat to such a high standard is not a cheap process. As a result, there are mass-produced boats of a similar length that are significantly cheaper to buy, although there’s no guarantee they will be easier to look after in the long term. 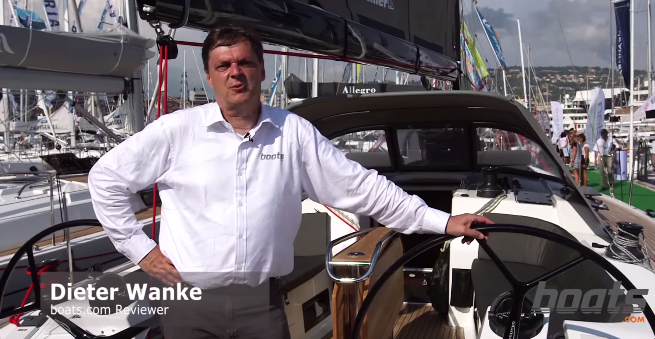 The 55 is the smallest in the company’s three-model range that also includes a new 58-footer and the Discovery 67. See also: Discovery 57 review. 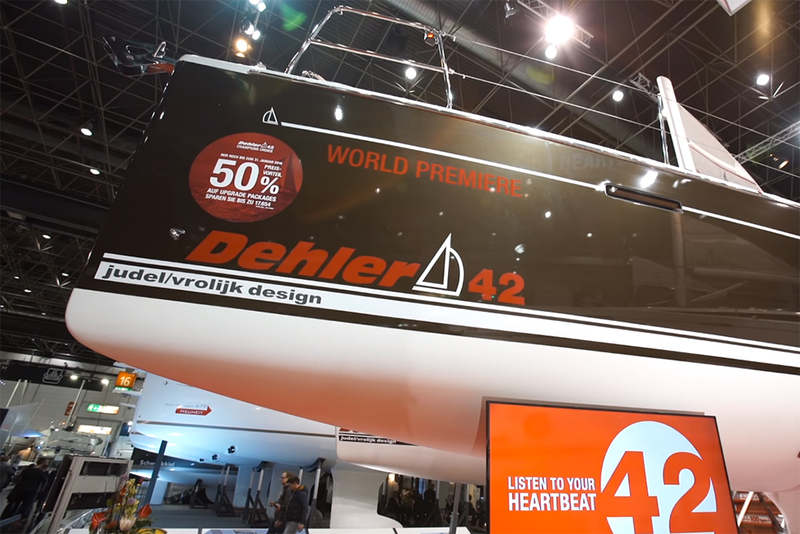 Oyster’s 545, another quality British built long-distance cruiser, is the most obvious alternative boat, while the Dutch-built Contest 57CS is also aimed firmly in the same part of the market. Similar sized Hallberg-Rassys and the Amel 55 are also possible options, although they can’t directly match the Discovery’s watch keeper’s position or its deck saloon.